How many different ways can you sit? How many different ways can you stand? 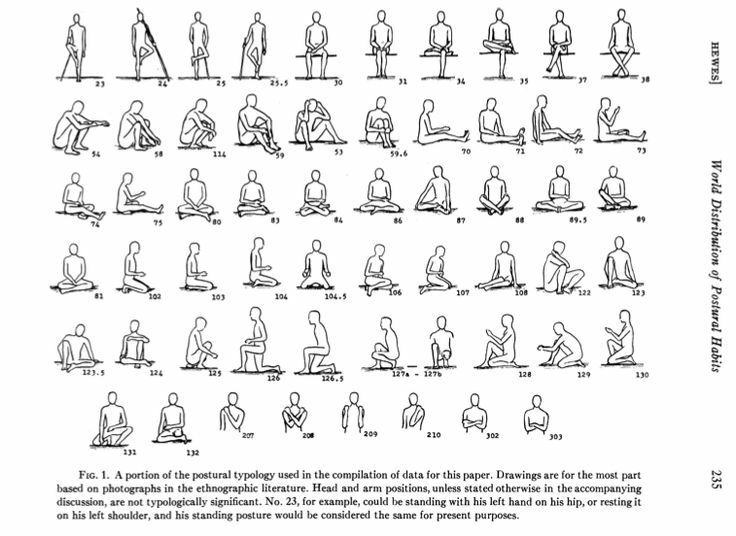 The top row of this poster, “Think Outside the Chair“* might give you some ideas for ways to vary sitting and standing poses. If you have the latitude at work, don’t limit yourself to chairs. Stand up, sit on the floor or even lie down for some of the time. Are you practicing sitting in a chair without back support? It’s easiest if you’re sitting quite high up (on a bar stool for example). The greater the angle between your legs and torso (approximately 120 degrees might be ideal), the easier it is to sit upright. The closer your legs and torso are to making a right angle, the more strain it puts on the back. Sitting on the corner of a chair (pointy edge between the legs) is an easy way of getting on top of your sit bones. This also helps your back. Chose about 4 different sitting positions and 4 different standing positions and consciously rotate through them during your day. It’s really hard on the body to hold the same position for 8 hours, but not so bad to sit and stand in a bunch of different ways. Slumping is not so bad if you do it CONSCIOUSLY as a rest for a minute or two, versus hours at a time. You can also rest your back muscles by rolling your spine forward over your legs, hanging your head and breathing into your back. Even better, take a break and lie on your back in Constructive Rest for 5 to 15 minutes. Leaning back on the chair is fine if you feel tired. It helps if the chair back does not also lean back, because then you will be likely to push your head forward to see what you are doing. You can prop yourself up against the chair back by placing a pillow under your shoulder blades and upper back (vs. supporting the lumber spine). This also helps create a little traction between the top of the pelvis and the lower ribs, which stretches out the low back. For further help, contact your local Alexander Technique teacher!